Your browser is unsupported please update to a safe browser using the link below. We no longer support Internet Explorer 7 or 8 as they are now unsupported by Microsoft. 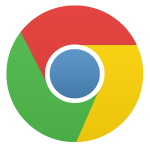 Google Chrome is regularly updated to keep you safe on the web.